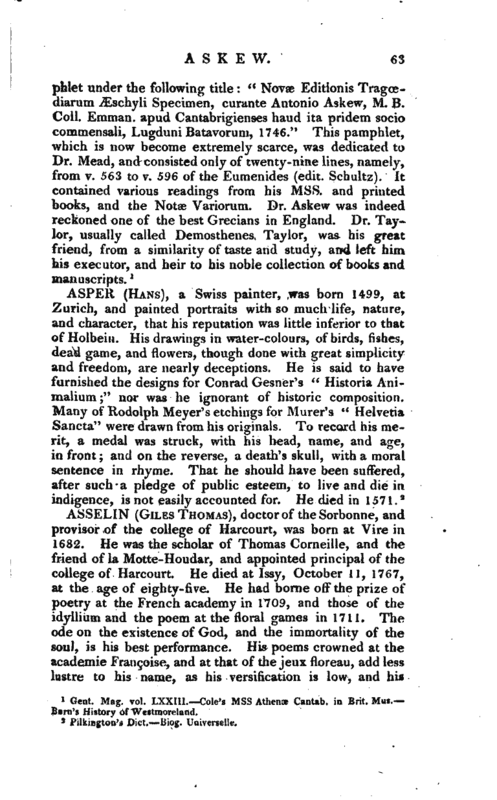 , M. D. an excellent scholar and promoter of literature, was born at Kendal in Westmoreland, in 1722. His father, Dr. Adam Askew, was in such high estimation at Newcastle, that he was considered as another Radcliffe, and consulted by all the families of consequence for many miles round. Anthony was educated at Sedburgh school, and from thence removed to Emanuel college, in Cambridge, where he continued until he took his degree of B. A. in December 1745. He then went to Leyden, and resided there twelve months, with the view of being initiated into the science of medicine. In the following year we find him in the suite of his majesty’s ambassador at Constantinople. Returning from thence through Italy, he came to Paris in 1749, and was admitted a member of the academy of belles lettres. He had here an opportunity of purchasing a considerable number of rare and valuable Mss. 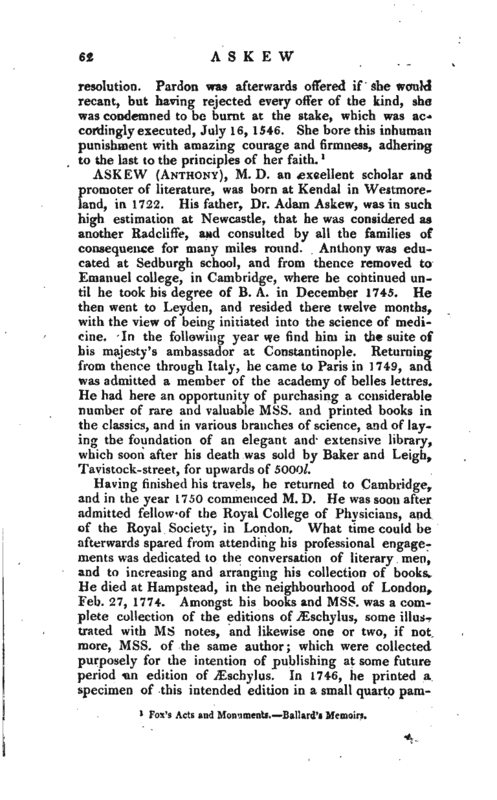 and printed books in the classics, and in various branches of science, and of laying the foundation of an elegant and extensive library, which soon after his death was sold by Baker and Leigh, Tavistock-street, for upwards of 5000l. Gent. Mag. vol. LXXIII. Cole’s Mss Athenw Cantab, in Brit. Mas. Barn’s History of Westmoreland.